Fiction – Kindle edition; Hachette Australia; 304 pages; 2017. 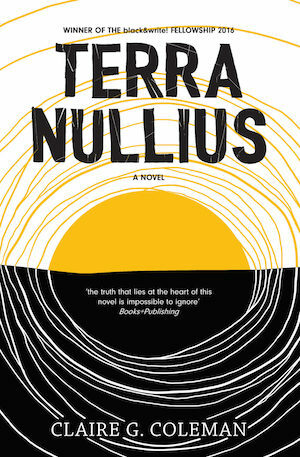 Claire G. Coleman’s Terra Nullius is a damning portrait of colonial settlement in Australia. Told through a series of intertwined narratives, it seems to mimic the history of aboriginal dispossession at the hands of white settlers, but a clever twist about a third of the way through indicates the story is about something else entirely — and the revelation is unsettling if you’re not expecting it. Shortlisted for the 2018 Stella Prize, this novel gets full marks for originality, but I’m afraid I didn’t really warm to the story. Whenever I put it down, I was loath to pick it up again. And yet I so wanted to love this book. I bought it long before its prize listing because it had received such great reviews and I had saved it up for months, waiting for the right time and place to begin reading it. I think my main issue is that I didn’t really connect with any of the characters, even those I liked and would normally want to cheer on, such as Jacky Jerramungup, the fugitive on the run from the homestead where he’d been held as a slave. Perhaps it’s because all the characters were poorly drawn; they lacked depth and had little to no interior life, making it hard to understand their motivations or beliefs. Some were even horrendously clichéd, such as the horrid bad nun, Sister Bagra, who treats the stolen children in her care with cruelty and inhumanity. And for a book that has an important message to impart — about “otherness” and subjugation of indigenous peoples — a message that needs to be told, it just felt too heavy-handed, too obvious. I suspect that was deliberate because the author thought there was no room for nuance in the story she wanted to tell. I also thought the novel was too long, too repetitive and the pacing was too slow. The bulk of the narrative is a chase story — a man on the run from the law — but it seems to take forever to get to the climax. The editor in me reckons it could easily have been told in half the number of pages and perhaps it might have been even better as a short story. But what I did like was Coleman’s writing, which is stripped back and almost devoid of adjectives unless they’re absolutely necessary. Her descriptions of the landscape, in particular, and the Australian climate are vivid and wonderfully alive. She describes dawn as “tentative tendrils of light”, rugged woodland as full of “dripping trees and scratching, tangling, grabbing bushes”, the heat as being strong enough to “melt the new paint off your walls”. And I appreciate the way she takes history — including all the ugly bits that have shaped white and black relations in Australia — and presents it as something new, as something revelatory, as something that should make all of us sit up and listen: what if this had happened to us and not them? So yes, there’s no doubting that Terra Nullius is a powerful book and an important one, but while I appreciate the author’s aims and her motivations, it just didn’t work for me. This is my 6th book for #AWW2018 and my 2nd for the 2018 Stella Prize shortlist. Oh I wanted to love this one to. The premise sounds great, right up my street – I like to have my eyes opened to something very real that I really should have more awareness of – whilst at the same time enjoying a well written novel. But perhaps this one isn’t going to hold my attention…I’m feeling pretty brutal these days. It’s speculative fiction, not literary, so that caught me by surprise, I think, and as Lisa points out in her comment below, that particular genre isn’t known for its strong character development. But if you don’t know anything about Aboriginal dispossession at the hands of white people it’s an illuminating and unsettling read worthy of your attention. I’m starting to get the impression that this is a vegemite (marmite) book – you either love it or you hate it. I loved it, as did my book club, but I have read online that not everyone does. I think the “cleverness” of the structure was a winner for me, and the descriptions of the Australian landscape, as you pointed out in your review. Oh yes, definitely a Vegemite book! I had guessed the twist in the middle having seen someone on Instagram give away the plot, so I didn’t get to experience the shock of having things turned on their head; I was expecting it. And I think that twist is what makes the book so powerful. Yes, I agree. I had only read Lisa’s review where the twist was skilfully hidden so I wasn’t expecting it. It turned me off to start with, and I had to go back to Lisa’s review, which convinced me to continue reading. And I’m glad I did. Having said that, my husband read it after I had and I’d already given away the twist (as I didn’t think he’d read it) and he enjoyed it as much as I did. I quite like dystopian fiction, and have read a bit of it, so perhaps that also explains a little of our different reactions. This is a new Indigenous writer writing about her country – and the country that I live and work in – and for me it just explodes off the page. A dead cert for this year’s Stella. Yes, I rather suspect this book will win The Stella. I have no objection to that because it’d be a great thing for more white Australians to comprehend a little of what dispossession feels like. Coleman can clearly write and has powerful stories to tell, so my criticisms are largely about the genre which isn’t one I’m terribly familiar with. Well, I’m one of the fans, possibly one of the rave reviews that raised your expectations too high. I think some of your reservations relate to the ‘genre’ of the book . Though it’s a blend of genres, its style and form is deliberately derived from mass market speculative fiction, and one of the classic objections to classic SpecFic is that the characters are just sketched and/or rely on clichés. Sister Bagra is exactly as you say, but that is because her character is derived from the memories of Stolen Generation children who like all of us vividly remember the mean and cruel people in our childhoods without any understanding of what might have made them like that. This book is deliberately designed to force us to confront the stereotypes we use for The Other, and if we find ourselves wanting to humanise them, then that should make us confront the stereotyping that we falsely rely on in the real world. Like Bill, I’d like to see it win, if only because the Stella originators said at their launch (I was there) that the prize was open to genre fiction (which is where female writers dominate) and it never has been so far. I think you’re right about my reservations relating to the genre. I’ve read a little speculative / dystopian / science fiction and it doesn’t generally work for me (with one or two exceptions), but I was so sure I was going to love this one it came as a rude shock when I didn’t. I’ve read plenty of “chase novels”, too, which are one of my favourite types, but this one didn’t have the pacing or the suspense I’d expect to make me keep turning the pages. Interestingly Coleman and Scott are of the same mob, but yes Scott is at another level, matched only by IMO Alexis Wright. I bloody love Scott… am reading Taboo now. Not read Alexis Wright…yet; I have a couple in my TBR but the SIZE keeps putting me off. Ah yes, I love Benang… but I think Indigenous people need to tell their stories in ways that will appeal to the mass market as well. I hope your shoulder is improving? It’s always interesting when a book divides readers like this, It sounds ambitious but it’s hard to make an issue-led story not heavy-handed, like you say. I finished this book yesterday and really enjoyed it. I agree with a lot of your comments but much to my surprise it didn’t bother me that the main characters lacked depth. The lack of subtlety with the colonisation didn’t grate on me as much as I would have anticipated either. I think I just took the general impression and message rather than wading through each point. When I was reading it I did constantly think of things I would have done differently if I was the author (mostly a more authentic historical setting and voice, more innovative SF elements) but overall I thought for the genre (commercial spec fiction) it was a good read (but I am not an expert on this!). I think it has a good chance of winning the Stella, particularly if they are genuinely open to all genres! I, too, think it has a good chance of winning the Stella. I really did want to like this book a lot more than I did… but speculative fiction’s not really my thing and I’m afraid I’ve reviewed it with my literary fiction hat atop my head. Oops. Glad to hear you enjoyed it though… I seem to be in the minority on this one.